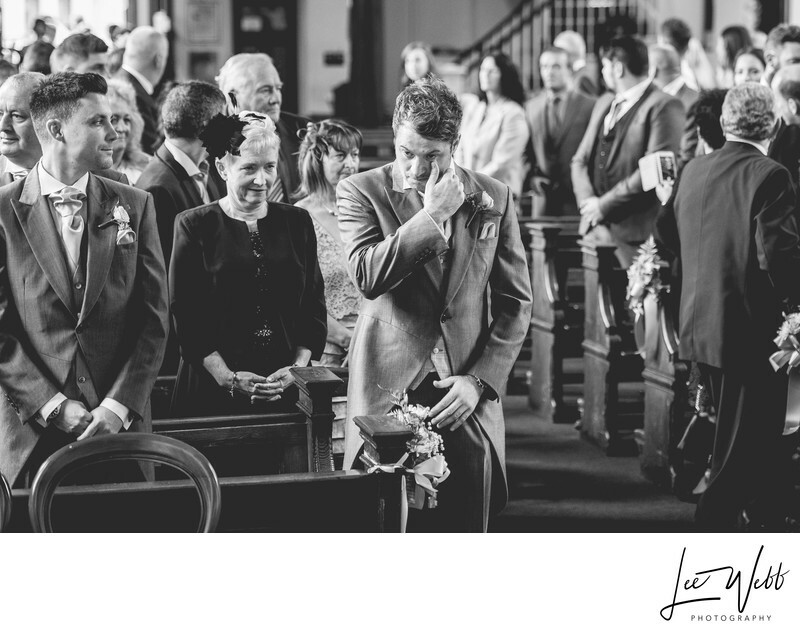 Steph and Rich got married in St Georges Catholic Church in Worcester. This amazing church couldn't be any closer to the centre of the city and is close to a main road, but when you're inside the church you could be anywhere. It's absolutely silent and deceivingly large on the inside. This image for me stands out among Steph and Rich's wedding photos because for me, it was one I honestly didn't think I'd be taking. When I met Rich a couple of years before his wedding, at our initial meeting he seemed like a man's man. A man's man, a motorcycle racer; It really seemed like nothing would faze him. I couldn't have been more wrong though. As you can see from the people turning to look over their shoulder in the background, the bride was about the make her entrance. The wedding cars had arrived, the music was playing and the doors were about to swing open. And Rich's emotions get the better of him. I'm glad that I was there to take this photo otherwise people might not have believed it happened! This is the true beauty of documentary wedding photography (sometimes called reportage wedding photography) - The ability to capture those moment that might otherwise have been missed or go unnoticed. They say that a picture paints a thousand words, and I find that with this image, the more time you spend looking at it, the more you notice; The guests getting ready to take photos on their phones in the background, the guests straining to get a glimpse of what's going on, the mother of the groom smiling at her son, and the look on the best man's face all go a long way to telling the story of this wedding without anyone needing to say anything about it - And that's the absolute goal of documentary wedding photography: Telling a story with a single image. Location: Saint Georges Catholic Church Worcestershire.